There is no better feeling than when you wake up in the morning weary and disgruntled thinking of going to school (or readying the kids for school) and then suddenly hear that it’s a holiday because of the rains. Really! It is a one-of-a-kind feeling. Not the same as knowing before-hand about a holiday. Not the same as pretending to be sick and taking leave. This is guilt-free, unexpected, sudden joy. Nothing like it! Bliss! The past week was just this. After the first rain-holiday, we got into the practice of groping for the mobile phone first thing in the morning and squinting through half closed eyes checking our SMS’es for the school’s announcement hoping for another rain-holiday. And they never once disappointed. Every day the school sent an SMS announcing a holiday because of the rains. Yuvi would lift up his head to confirm if it was a holiday “Amma leave a?” and when I told him it was, he’d smile contentedly and drop back on to his pillow. I’d curl up next to him and go back to sleep. I always wait for the rains. 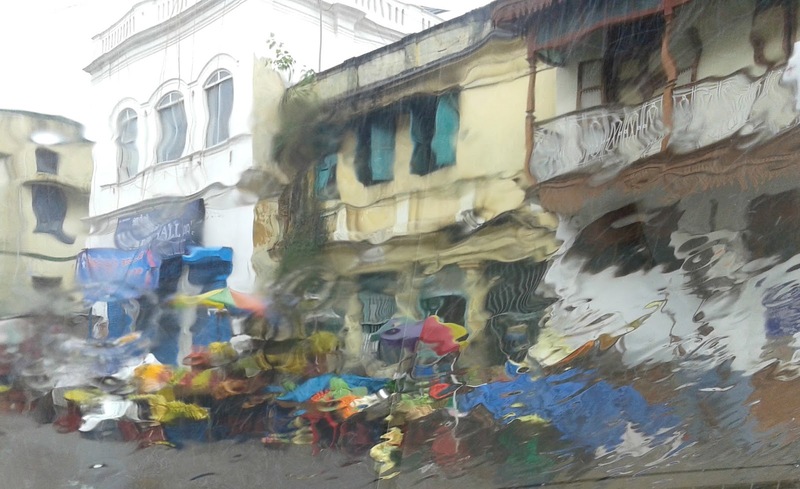 Madras looks so much better in rains – atleast the first day. By the fourth day I want the bloody thing to stop. I’ve run out of my kids’ jatties (underwear). It is such a pain hauling all the wet clothes around, laying them out on tables, racks, coat-stands and mats all over the house, turning them over half way through and personally fan-drying every T-shirt, nighty and lungi. This time I just let it all soak up 3 days of non-stop north-east monsoon rains. I was down to my kids’ last few emergency jatties in my handbag but I decided to let go (of the wet clothes), live the moment, enjoy the rain. What I miss is a large window to sit by and watch the rain however clichéd that may sound. I am a sucker for such clichés. Bajjis during rain must the most dog-tired, hackneyed clichés around and I may say it often too but you will never catch me saying “No” to bajjis when it is raining. The truth is you will never catch me saying “No” to bajji anytime, rain or not. 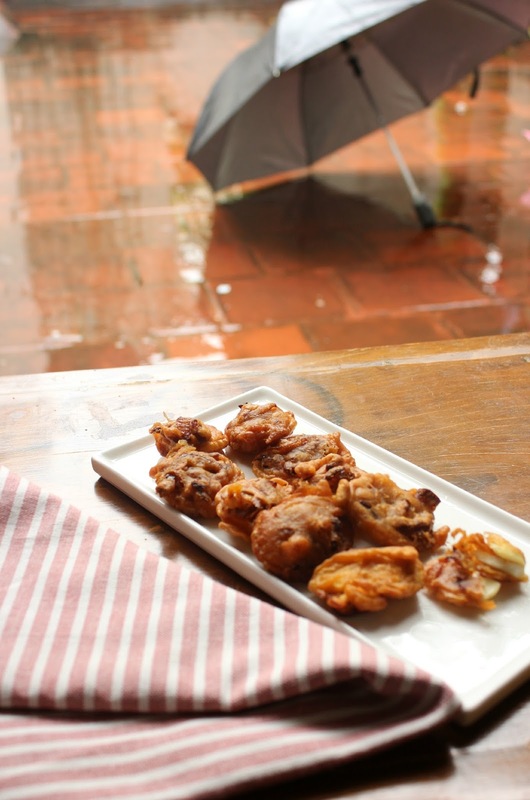 You have to admit that the idea of sitting by a window looking at the pouring rain, biting into hot, crunchy bajjis alternated by a sip of piping hot coffee sounds quite simply heavenly. 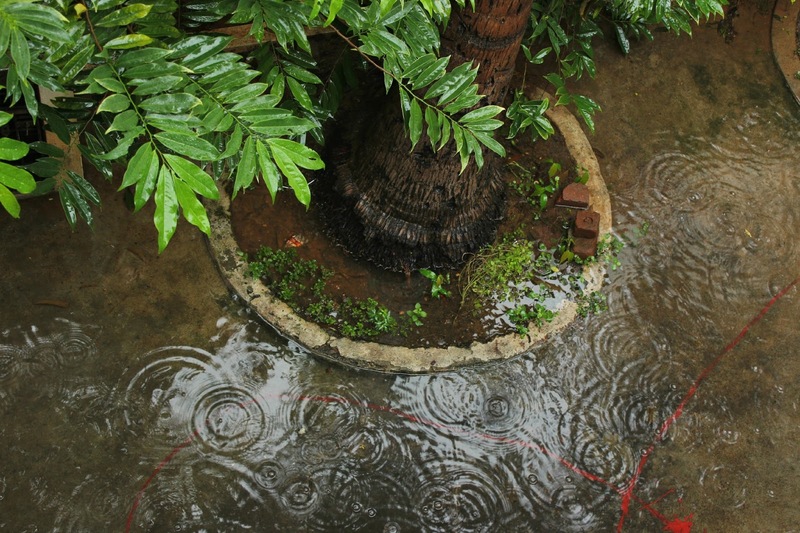 I couldn’t just let such magnificent rains go unsung. I had to pay my tribute. I hard-boiled eggs, sliced them into real thin slices using a nifty little egg slicer, topped each slice with a little bit of spiced fried onions, dipped into a chickpea batter ever so carefully holding the onions in place and then deep fried the batter dipped, fried onion topped egg slices to crisp, golden perfection. Ah.. I love deep-fried clichés. 1. 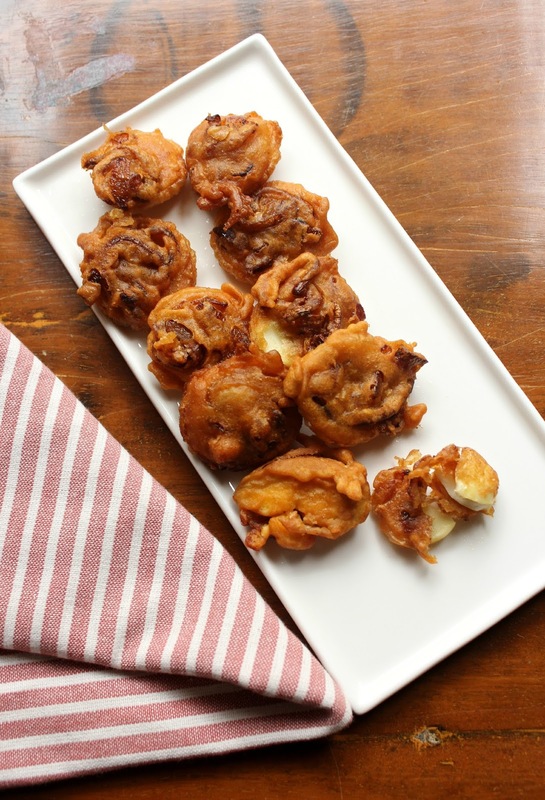 Combine all ingredients for the bajji batter except water in a large bowl. Add water little at a time and whisk to make a lump free batter which is not too runny but not too thick either. Set aside. 2. Fry onions in 1 tbsp oil adding salt, red chilli powder and cumin powder till soft and golden around the edges but not crisp. Set aside. 3. Boil eggs, cool and set aside. To boil eggs, place them in a pan immersing them completely in water. Bring to a boil and boil for 7-8 minutes. Then cover and turn off heat. Let stand for 10-15 minutes. Run eggs under cold water and peel. 4. Slice boiled, cooled and peeled hard boiled eggs into thin slices. I used an egg slicer. You could use a knife too. 5. Heat oil for deep frying in a kadai till really hot. Whisk the bajji batter well before dipping. 6. Place about a quarter teaspoon of fried onions on an egg slice. 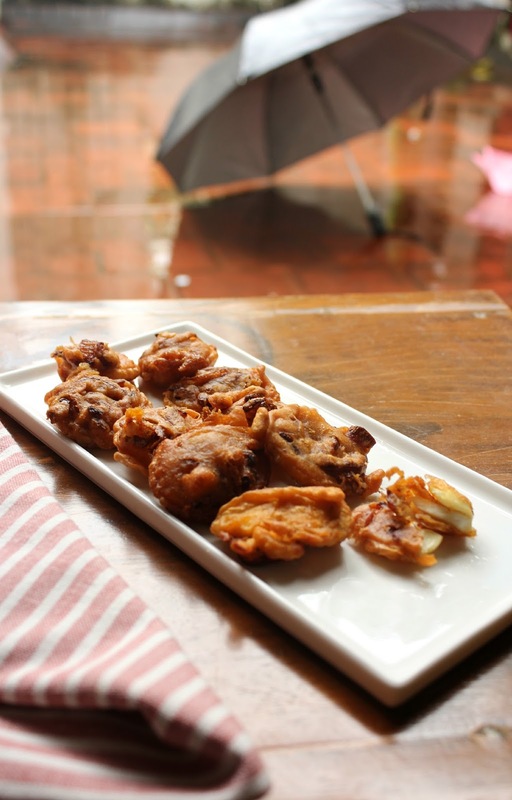 Gently dip the egg slice inside the bajji batter holding the onions in place and drop gently in hot oil. Repeat with more fried onions and egg slices but not crowding the kadai. When bajjis turn golden remove with a slotted spoon to absorbent paper. Serve hot with tomato sauce. This entry was posted in Appetizers, Tiffin / Breakfast and tagged appetiser, bajji, boiled egg bajji, egg, egg bajji, egg side dish, recipe, side dish, snack. lipsmacking egg bhaji! perfect food to match the lazy mood the rain brings along. I need to make these soon! Delicious food and perfect for food when you are moving to holidays. Thank you mam.